Do you like alcohol? What about breakfast? What if somehow, these two elements were conjoined into one party theme? With the kegs and eggs college party theme, you can mix the comfort of a good breakfast with the black out inducing nature of a lot of alcohol. You and your guests will take part in a night worth of continuous drinking until you either can’t handle any more or simply pass out. The next morning, you’ll wake up and partake in a hefty breakfast to offset the effects of your hangover. It’s a genius idea that even your parents can’t shake their heads at… entirely. For sleeping arrangements, you can simply go with a basic set up of sleeping bags. Of course, you don’t want to buy sleeping bags for each of your guests, so just make sure they know that they’ll be staying over. Chances are, more than half of them will wind up passing out wherever, so it probably isn’t a big deal if they don’t bring anything. Everyone should at least bring a pillow, just so they have something to lay on. 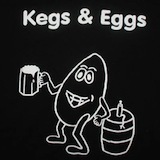 The traditional beverage of choice for a keg and egg party is something that comes in a keg. Really, though, you can provide any range of alcoholic beverages. If you want your guests to pass out quicker, go for hard liquors. If you want it to be a gradual progression from sober to tipsy to drunk to blacked out, than a keg and some red plastic cups is perfect. Now, the breakfast. You may need someone (or several someones) to play designated chef if you want to keep things in house. Buy plenty of eggs, bacon, pancake mix, coffee and orange juice for a well rounded feast that will counteract against a massive hangover. The trick is to not drink yourself to nausea the night prior so that you can thoroughly enjoy this large feast of deliciousness. There are a two more variations on the keg and egg party. One which focuses on a night out topped off with a stop at a breakfast joint when the sun starts to rise. This one is hard to pull off, as all party members must be able to carry themselves around. To make it really interesting, you can barhop until its time to indulge in some morning treats. The third variation combines the concept of having breakfast and drinking. Rather than separate the two, the party will have guests enjoying a keg while they scarf down some eggs and bacon. How you want to party is all up to you and the resources you have available! Pajamas. There you have it. If you’re going to stick with splitting the two up in one event space, pajamas will provide a fun and comfortable way to party! Everyone can make fun of each others choice of sleepwear, especially if someone shows up in the coveted footed pajamas.